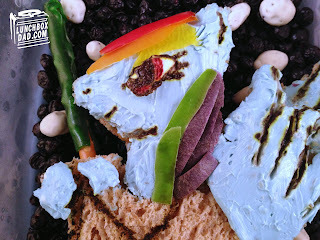 Year 2, Week 2: My Little Pony's Rainbow Dash--with a light saber? My kids and I were riding in the car the other day and we were talking about how funny it would be if My Little Ponies were Jedis. Its no secret that my kids and I are big Star Wars fans so with apologies to the purists out there, I had to make this lunch. I knew after that conversation with my kids that there was no way around it. Sometimes you have to weigh the consequences and decide if you should please your kids or please those who hate Ewoks and Jar Jar Binks. Ok, bad analogy--everybody hates Jar Jar! This lunch took a bit longer than I expected but hopefully it will be worth it when she opens it up in the cafeteria today. This was made in an Easy Lunch Boxes container. If you want to see some of my other Star Wars or My Little Pony lunches here they are: Chewbacca, General Star Wars, Princess Leia Hamburger, Applejack. 1. Use bread and cut out jedi robe with hoofs, wings, and head as shown. Cut out second set as well. Use desired ingredients and press pieces together to make a sandwich. Spread blue cream cheese on hoofs, wings, head and neck. 2. Get a potato peeler and cut strips from peppers and potato. Place strips on head where seen in pic. Use one dab of white cream cheese for eye. Draw facial and body details using toothpick and black and purple food coloring. 3. Wrap very small fruit roll up piece around a pretzel stick. You could also use a kiwi on a toothpick or a small light saber toy if you wish. Place in Rainbow dashes hands. Put all pieces together in main container. Surround with dried blueberries for background and drop in a few yogurt covered raisins for stars. 4. Put rest of the sweet peppers in a side dish. Write words on slice of cheddar cheese as shown with a toothpick and black food coloring. Place cheese on top of sweet peppers. 5. Take hard boiled egg and draw Stormtrooper features on the front as shown in picture. Place egg in other side dish. 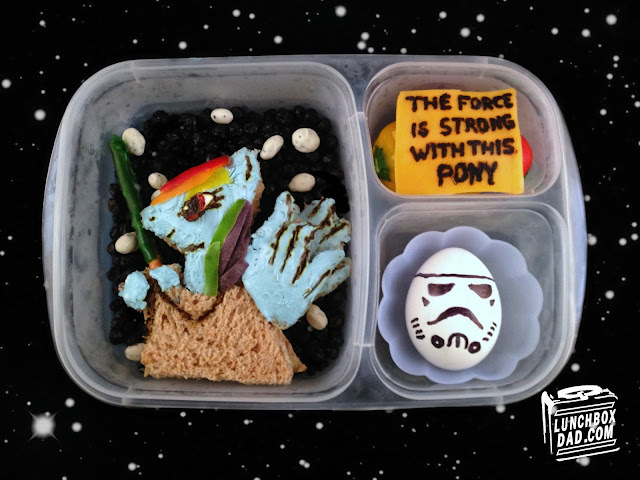 This lunch is one the harder ones on my site but it is really unique and a fun one to attempt if your kids love star wars and my little pony. If this isn't your cup of tea try some of my other Star Wars lunches. I hope your school year is going well and remember to follow me on Twitter and Facebook in order to see so many more pictures and recipes from my me and other bento making friends. May the Force Be With You! This is just toooo perfect! Such a creative and fun lunch! Thanks Kathy, we will see how my daughter liked it! Wow! Not everyone can combine My Little Pony and Starwars! My daughter would LOVE this! Im not even sure if it SHOULD be done, but it was here for this moment in time. I hope my daughter liked it for lunch! Thanks Karen, I worked hard on the rainbow details trying to make them healthy and fun. I'm glad the sweet peppers worked out. Thanks Christine, I never thought they would go together but I guess they can in a lunchbox. This is so silly and awesome. Thanks for sharing. Thanks for commenting I'm glad you like it!